September used to be my favorite month of the year. Where I am from, September is the official start of fall. It is a time of new beginnings. It is when the air starts feeling like fall and you can literally smell it. It starts to get cooler. I used to love that time of the year. Now, for many reasons, September is the hardest month of the year for me. First of all, it doesn't feel like fall. Ever. But I have learned to live with that for the most part. Most of why I dislike September is because it is a reminder of the the two most defining times of my life. My daughter, Emma, was born in September almost twelve years ago. The day she was born was the day I was faced with the harsh reality that we live in a broken world and bad things happen to everyone. I knew that, of course. I had been taught that all of my life but I still never believed they would happen to me or the ones I love. When Emma was born I lost so much. I lost my dreams for her, for myself, for Allie. It took me years to accept what had happened. I loved her with all of my heart but I was so full of hurt for her. I could not stand the pain she was in. Each time she was sick, each test she had to have, each needle they stuck in her tiny veins, each time they had to replace her feeding tube and she cried in pain; I felt that pain in my heart. I would have done anything to take her place. Even then, though, you get used to that life because it becomes all you know. It becomes a part of who you are. So, as the years passed, I took that life for granted. It was in September, nine years later, that Emma left us. I had told her so many times when she was sick to please hold on. I had pleaded with God for her life. But somehow, that September, I knew it was time to let her go. I had seen her suffer for so long and her future was looking grim. I knew that the worst was yet to come so I told her it was okay to go. I told her that if her time came, it was okay to leave. I told her I would be okay. Two weeks later, she went. Even though I knew it was her time and even though I knew she was in a better place, I felt lost and confused and angry. I wanted her back. I wanted to hold her in my arms, to hear her laugh, even cry. I wanted my baby back. I still want her back. Every single day. I have a friend whose daughter died of the same thing Emma had and she told me that one of the worst anniversaries was the one in which Hailey had been gone the same amount of time she was here. I hadn't thought of that before and I think she is right. I still have six more years before that happens but I am already anticipating it with dread. 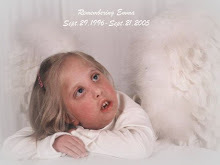 This year marks three years that Emma has been gone. It also marks six years that we have been at this church. Our friends here have known us without her just as long as they knew us with her. That doesn't seem right. I don't like to even think about that. I want to shout, "Don't forget her! Don't forget who we are!" I wonder if they feel her absence. I wonder if she changed their lives. I wonder if they remember me the way I was. I wonder what they see when they look at me now. There are some people in our lives who never even knew her. Can they tell that part of me is missing? Will they ever truly know me? These are questions I think about. These are the things I am trying to figure out as I live this new life. I guess that is why I sometimes long to go back to what I know. To the people who have always known me and loved me. I need to be reminded of all of the things that have made me who I am. The good and the bad. September is hard. September is full of memories. September sneaks up on me every single year and I am never prepared for all of the emotions. You may want to stop reading this blog until October! I'll be praying for you during this tough month. I am so thankful for our friendship!